Especially if you want to climb Huayna Picchu (at an additional cost). You can use this website to buy tickets to Machu Picchu. We also suggest using this TripAdvisor guide we found since it’s a little more complicated than most ticket purchases. If you get them online, remember that there are three steps: reserving, purchasing, and checking in. The print out you need to show at the entrance is the PDF you get once you’ve checked in online. If you do want to climb Huayna Picchu, keep in mind they only allow 400 people up a day; 200 at 7am and 200 at 10am. A good and free alternative is climbing up to the Sun Gate. It takes about an hour to climb up and an hour to get back down but, like Huayna Picchu, you also get beautiful views looking down on the ruins. The stone trail isn’t extremely hard, but you’ll probably end up stopping a few times to catch your breath. And to take pictures. They do have storage by the entrance if you want to leave backpacks / luggage. The cost is 3 soles ($1). Normally we advise everyone to travel around with a copy of their passport and to leave the original in their hotel/hostel, but after 9am there is a table at the entrance of the park where you can get a stamp of Machu Picchu on your passport. You do it yourself, so there isn’t an official feel to it, but it’s still pretty cool to do. We saw some women in wedges, and although they looked cute, they were a rolled ankle waiting to happen. You’re going to be doing a lot of walking and going up and down steps so keep that in mind when you’re getting dressed that morning. It was cold when we first got there but as the clouds lifted and the sun came out, it got hot. Quick. If you can, have a small backpack to put your layers of clothes as you shed them. Also, have a rain coat or lightweight waterproof jacket. We were lucky and didn’t get one drop of rain, but we’ve heard from others that it can rain a lot and sporadically. Early morning means clouds and cold, while afternoon means sunshine and hot! Sure, you can walk along with a guidebook or just walk around completely having no clue what you’re looking at, but I would highly recommend getting a guide. There are a lot of them outside the entrance and charge only 30 soles ($10) per person and they’re with you for about two hours. If you want a private tour it costs more, but we only had 3 couples in our groups so we thought it was worth the price. Our guide was great and provided a lot of information that otherwise we wouldn’t have found out. She also answered all of the questions we had. When the sun comes out, it beams! So wear sunblock and reapply if you’re sweating or have been there for more than a few hours, which most likely you will. Machu Picchu is huge! Once you’re inside there are no restrooms. You could be walking around for hours, so keep that in mind. And have change with you; it costs 1 sol to use the restroom. After we ended our 2 hour guided tour, we went back to the entrance and stepped out so we could use the bathroom. We were told you can step out and get back in 3 times, just remember to have your ticket and passport. There are no cafes, vending machines, not even garbage cans. So take stuff you can nibble on for a few hours. We took bananas, nuts, cookies, and bottles of water that we had bought at the market the night before. And don’t be a litter bug! Hold on to your garbage until you leave. So everyone can continue to enjoy this magical place, remember not to leave any trash! So helpful. Well written, too. It actually made me feel like I was there. I can’t wait to go myself sometime. Thank you for the kind words Carol! I hope you get to go one day; it’s amazing! What a great post! Machu Picchu is on my list for a big birthday. I won’t tell you which one. 😉 I will keep these tips. What an amazing place! All very valuable tips. Its great to know that it is worth while to get a guide and for that price, you can’t go wrong. Hi April! Yes, the price isn’t bad at all! I’ve paid a lot more in other places. 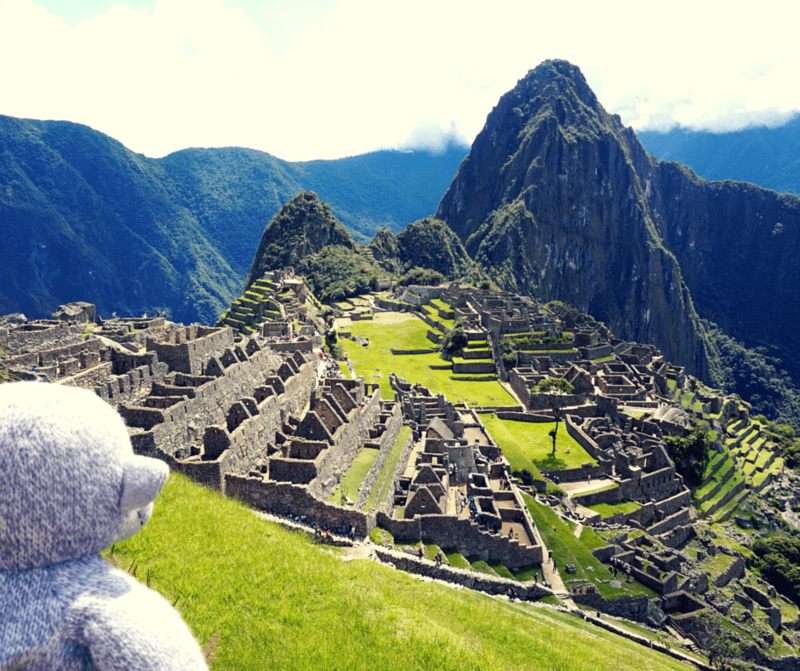 Beautiful pictures of Machu Picchu, Buddy looks so happy! It’s strange they don’t have garbage cans. I hope all the travelers are as conscious as you and don’t leave their trash. Vicky, thanks for these super helpful tips. Hi Brenda! I understand why there are no garbage cans; they want to preserve the look and feel of the ruins. It is a bit inconvenient, but nothing that can’t be handled. Buddy looks so sweet in your last photo! It must be the residual positive vibe! Your practical tips are going to be helpful to first timers and repeat visitors alike. Can’t wait to visit ourselves! What a great post. You made it feel so magical and not difficult as I was beginning to feel from various accounts. But maybe it is because you are young and sprightly. Should we worry? I’m 67 and my husband is 71! No, not at all Carol! You guys would do just fine! You can walk as far as you feel comfortable. And although there are steps, it’s nothing too strenuous. Everything is accessible and well laid out too. Awesome tips! I can’t wait to make it to South America and Machu Picchu especially. Love it, most of the people get so excited about visiting Machu Picchu that they end up forget simple things like water and sunscreen. Yay! And if you ever have any questions, feel free to contact me. I’m glad you agree about the guide. Some people prefer to do everything themselves or don’t want to spend the money, but for this I think the guide is worth it. Love tips like these- thank you! It is high on our list! Awesome! Glad you found if helpful Cathy! This is something I’d still like to do, but I’m not in my 20’s any more. What kind of physical requirements are there? Are you walking all the way to the mountain? Or are there shuttles that take you part-way there from nearby villages? Hi! I’m going on a tour of Peru this summer, and I have the option of hiking part of the Inca Trail (at a $300 fee) or taking the train which is included in the price. Did you feel like you missed out by taking the train to the top? Just trying to decide if it’s worth $300!